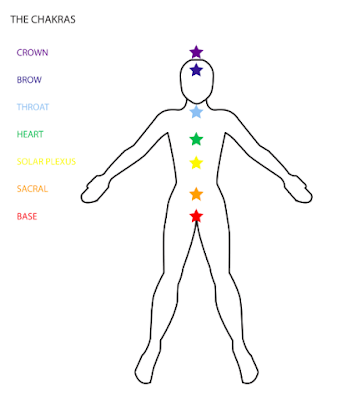 Today I would like to take you through a convenient Chakra Balancing Technique that I learned at the School of Intuition and Healing, where I qualified as a Healer. Balancing and clearing the seven main Chakras takes time, try this when you’re pressed for time but still need to cover all of the bases. I use it often on myself, as well as with clients. You'll need to practice hands on healing first, whether it's reiki or another modality. Check out the School of Intuition & Healing for classes in London or Capetown! The idea is to balance two Chakras at a time, leveraging the natural energy pairings between the Chakras. 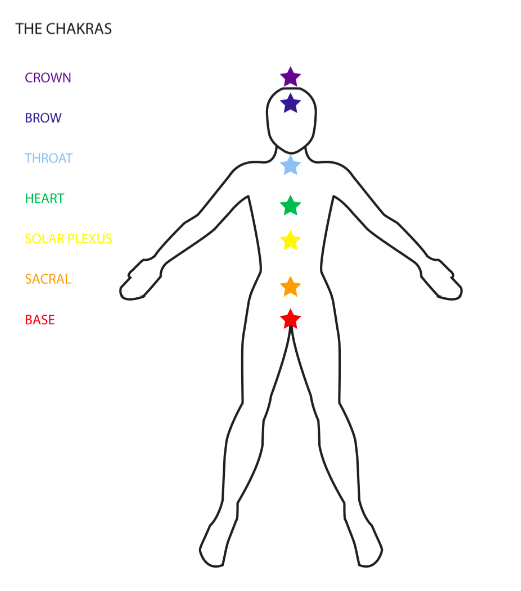 Our personal energy should flow freely along the central column reaching the seven main Chakras: Base, Sacral, Solar Plexus, Heart, Throat, Brow and Crown. Certain Chakras mirror each other, creating a stronger energy relationship between the two. So for example, the Brow Chakra corresponds to our thoughts, critical thinking, and vision but also, our preoccupations and worries. It’s mirror is the Solar Plexus, which holds our sense of self as well as our self-preservation instincts. Because of the energy bridge between them, the energy created by our thoughts feeds directly into the Solar Plexus. If those thoughts are peaceful, they reinforce a sense of wellbeing in the Solar Plexus. If they’re fraught with worry, they add to the sense of stress or dread in the Solar Plexus. To clear that from the body and from the energy field, we would balance, clear and heal both Chakras in tandem. You could start by placing one hand over the Solar Plexus, and another over the Brow Chakra. Feel the energy under the palms of your hand. Which is stronger? Let the energy push your hands out as far as they need to go, this will help quantify any imbalances. Send healing to both, and keep your hands there until they even out. You can also send healing to one chakra through the other. For example, the Brow tends to be very sensitive, and I often start by sending healing to the Solar Plexus, and taking advantage of that energy bridge to clear the Brow too. This bridge technique can also help with the other Chakra pairings. Each of the Chakras has a buddy. One of my classmates at the School of Intuition and Healing referred to this technique as The Ham & Cheese Sandwich to help us keep them straight. The Base Chakra, at the bottom of the spine, is paired with the Heart and Crown Chakras; these three are the bread in the sandwich. You would start by balancing the Base Chakra and the Heart, strengthening our connection to the earth and to our physical body. This grounds and protects us in LOVE and gives us earth energy for strength and stamina. Again, sense the flow of energy from each Chakra and balance them until they are equal. Then move each of your hands up one notch, to the Sacral Chakra and Throat Chakra. These are the Ham Slices in the sandwich. The Sacral Chakra is the source of our creativity, our passions and our appetites. The Throat is how we express it. You would feel the energy over each Chakra and balance them until they are equal. Tidy Up: Finish by grounding the legs. This Chakra Balancing Technique is taught at the School of Intuition and Healing in London. I was really lucky to be one of their first students back in 2010. Their healing course lasts two years and the next intake starts soon! Have a look! It has franchises in London and Capetown. This is just one of many lessons. Very Useful.Thank you very much.